My student who is from the small town of Rongxian asked me to come teach an English lesson to students from her old high school. We taught outside in the town square. 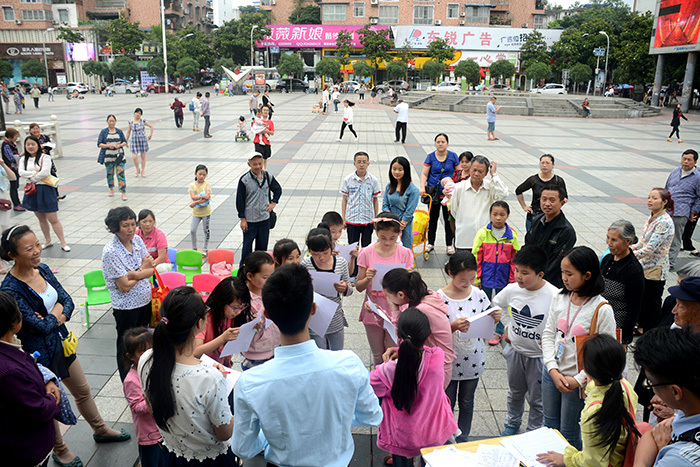 I was prepared to teach them a basic song and do an easy activity that I had done with the elementary school students in Zigong, but I really miscalculated the education inequality here in China. These guys were way behind the much younger students from Zigong and though they had been sitting through English classes for years, all we got from them was “hello, how are you?” Luckily, we were able to turn the lesson into a mindless rote memorization activity which everyone was able to do very successfully. I am very lucky to live so close to two giant stone buddhas. I’ve already been to see the Leshan giant buddha, the largest stone buddha in the world, and today I went to visit the Rongxian buddha which is about half as tall. 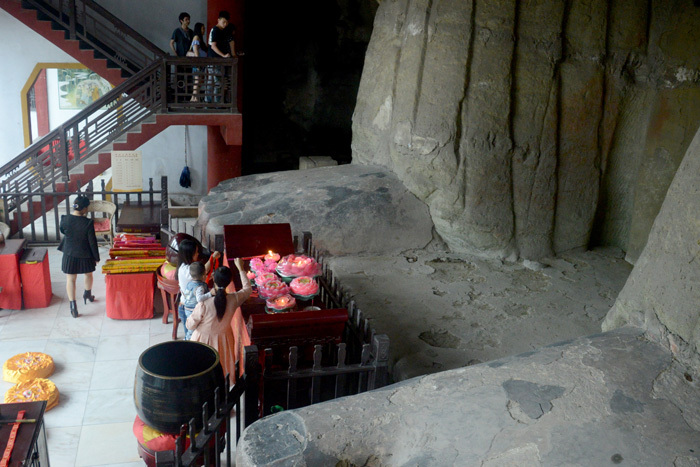 This rock-cut buddha dates back to the Tang dynasty and used to be covered in bright red paint. 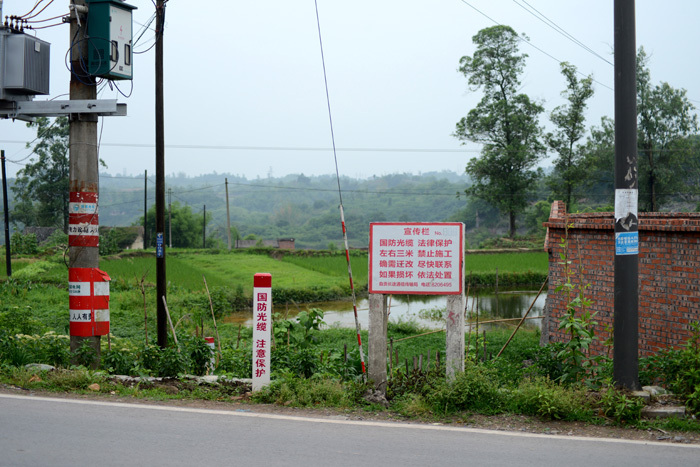 One of my students who is from Rongxian invited me to visit her town and it took us about two hours to get there. This was also her first time visiting the buddha because the entrance fee ($3.00) was too expensive for her family. I run an English Corner every Monday night for an hour. I prepare a topic and a list of 20 discussion questions and all students are welcome to come hang out and practice their English. 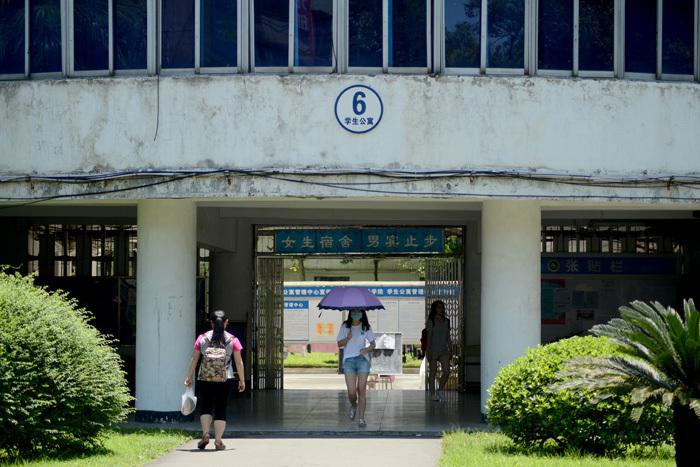 Usually we only get about 25 students though because most of them are way too shy to talk to the foreigner and the school schedules mandatory study sessions during the same time. That being said, I’ve gotten to know the few students who do come really well and English Corner has been one of my favorite activities this past year. This was our last English Corner of the year so we all sat on the field and sang English songs. 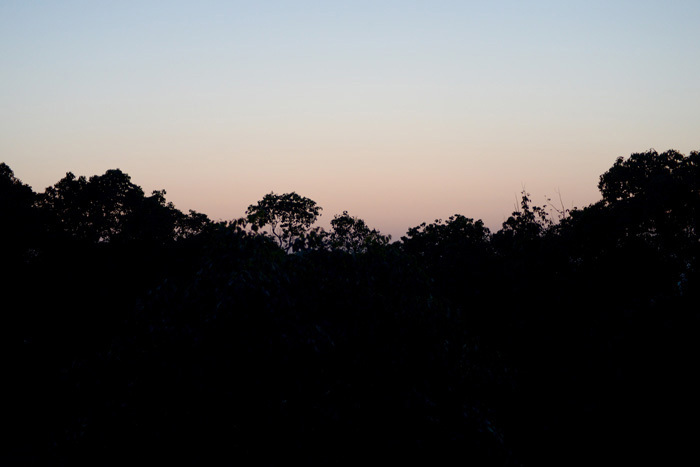 The view of the trees out my bedroom window. 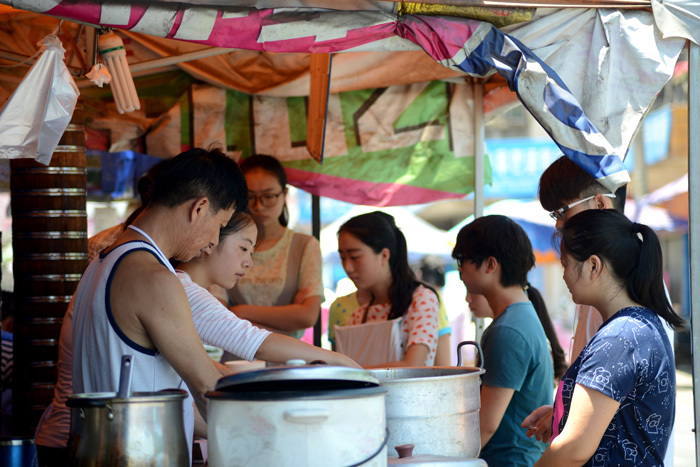 Students wait for their veggies or meat over rice at one of the food stands on the street. I’ve eaten a lot of new fruits in China that are hard to find back home. 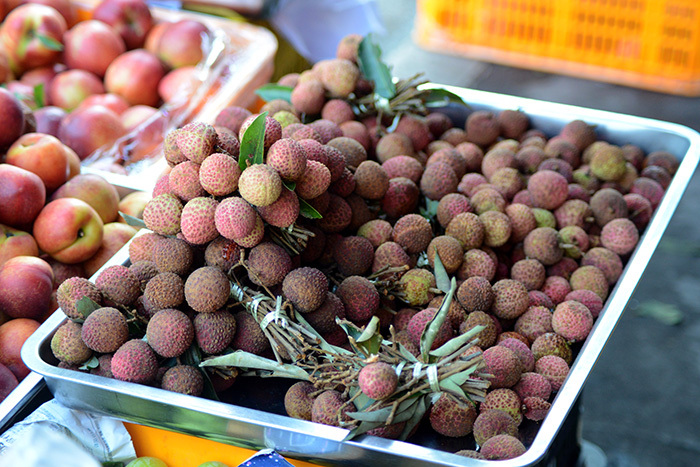 Lychee’s are white and sweet and have a big pit. I’ve also been eating durians, jackfruits, mangosteens, rambutan, star fruits, kumquats, loquats, jujubes, dragon fruits, longans, and pomelos. They are all great except for durians. Three of my lovely sophomore students came over to my apartment to teach me how to cook my favorite Chinese food, mao cai. I had posted on the Chinese social networking site, QQ, asking if I knew anyone who could make it. Many people responded, but Damon, in the middle, was the only person who could actually cook it herself. I’ve learned how to cook almost all of my favorite foods here and I’m really excited to cook everything once I get back home. I have been teaching Theodora, Damon, and Raffaella’s class for two years now and it has been so cool to see their English and confidence improve. 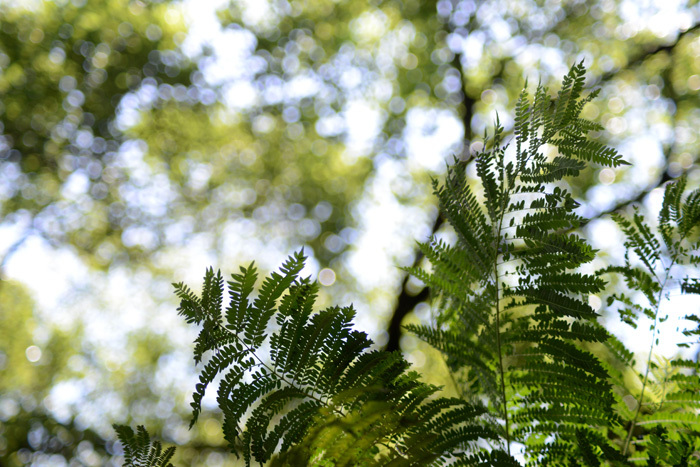 The weather is much, much warmer now. People have been washing their winter clothes, blankets, and furry slippers and leaving them out to dry in the sun. 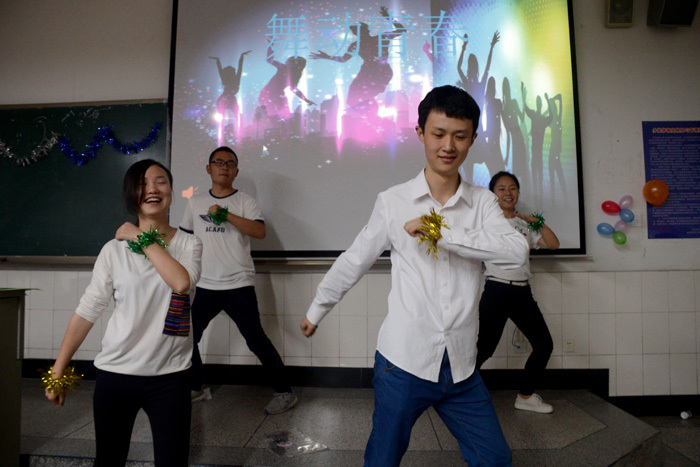 The school’s English association held their end of the year party in a classroom and students prepared skits and dances for entertainment. 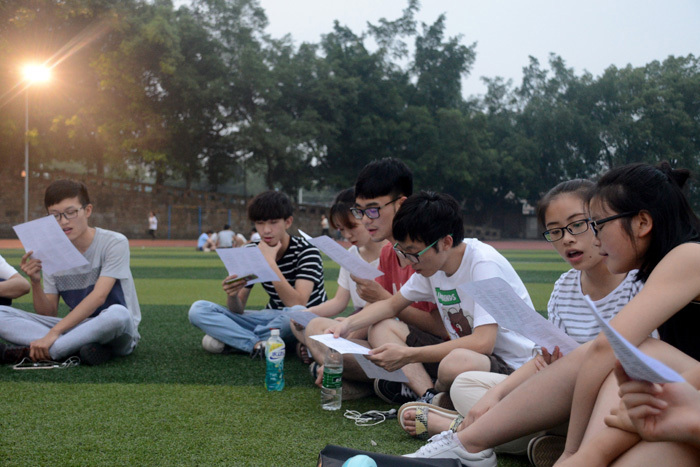 Many student parties are held in classrooms or on the track and instead of just chatting students sit in the chairs (or in a circle on the field) and watch performances. There are no house parties because students live in dorms and there is no alcohol on campus. This group danced to a Chinese chicken song. I looked it up online and found this song, but I’m pretty that their dance was to a different, less popular Chinese chicken song. 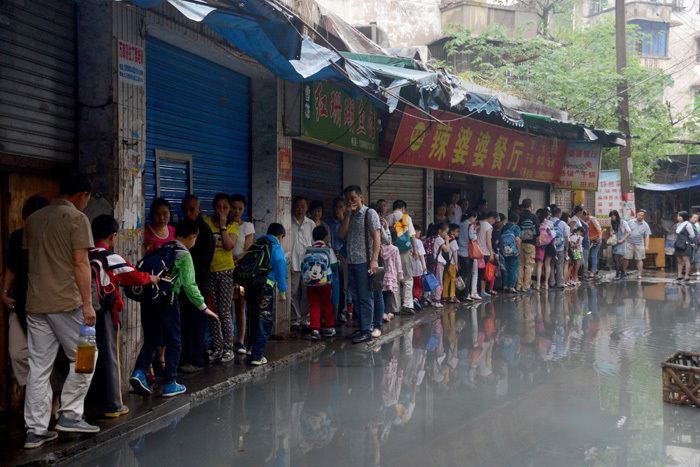 A crowd waiting for a bus. I tried so hard to get a picture of this kid looking in my direction, but he never did. 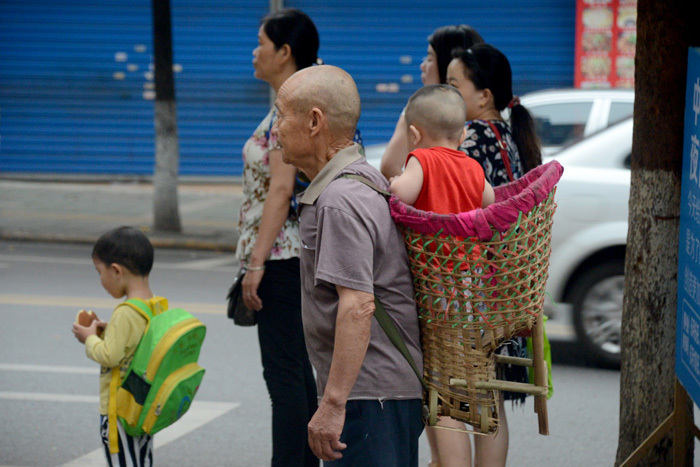 It’s very common to see grandparents taking care of their grandkids while the parents are off working in another province. 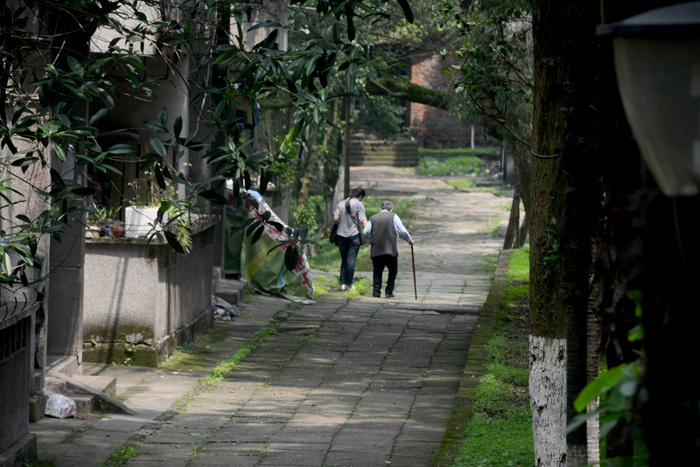 A student with a sunbrella and mask leaves the girls dormitory. 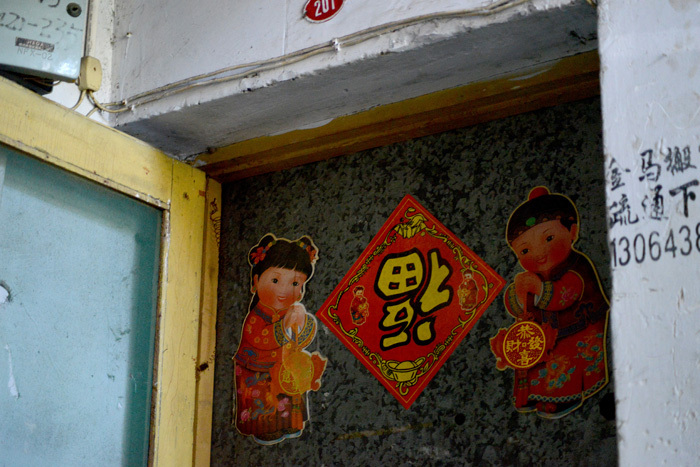 The character Fú means “fortune” or “good luck” and it is a tradition to put red squares with the character written on them on the entrances of homes. Families, like this one, hang their sign upside down because the words for “upside down” and “arrive” are homophones in Chinese. 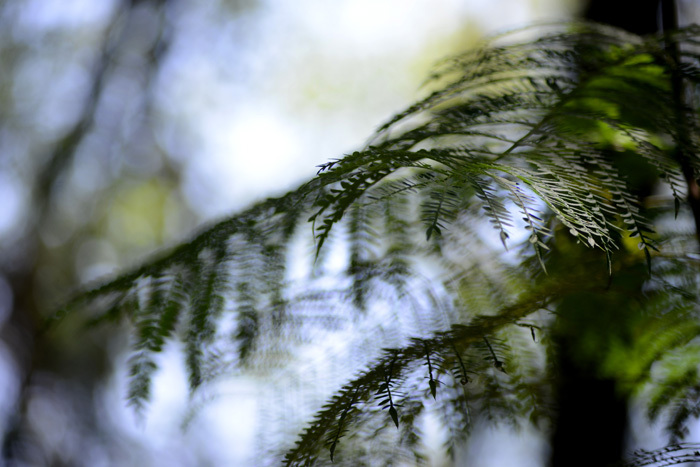 The upside down Fú literally symbolizes a wish for prosperity to come to the family. This is my favorite drink in my favorite drink shop. 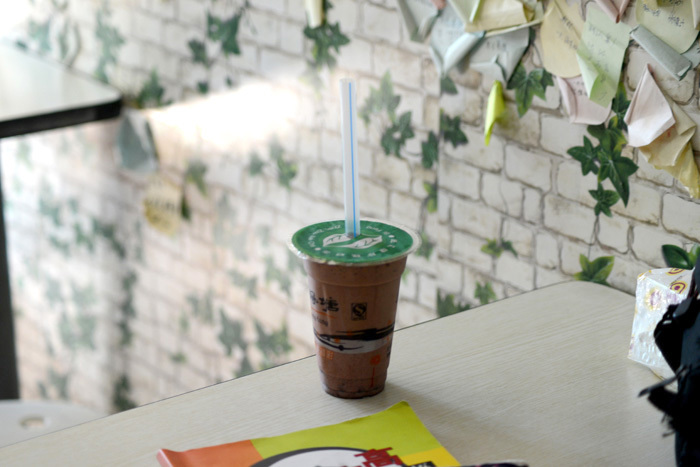 I like to drink chocolate milk tea with chewy tapioca balls at least once a week and recently have been hanging out a lot in this shop to study. The wall is covered in post it notes with little messages written by students. It’s almost time for graduation! 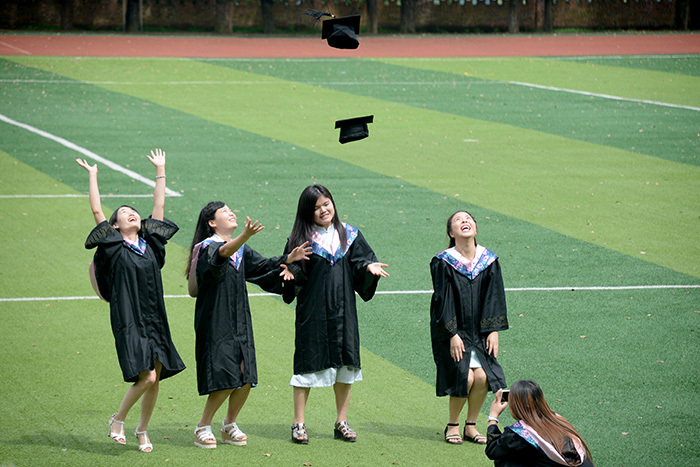 My campus is mostly only freshmen students who move down to the campus in Zigong once they finish their first year. 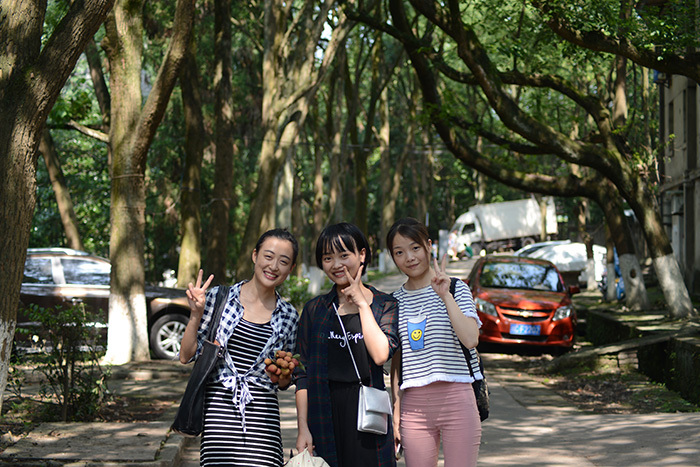 This past weekend a lot of graduating students came back to spend the day here in Huangling, taking graduation photos with their roommates. Four of my old students took me shopping in Zigong. We found some good stuff! 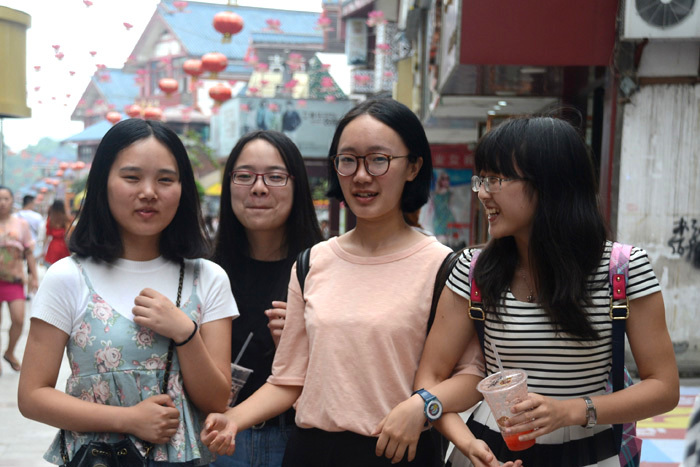 Lillian, third from left, is my Chinese tutor and one of my favorite people here. 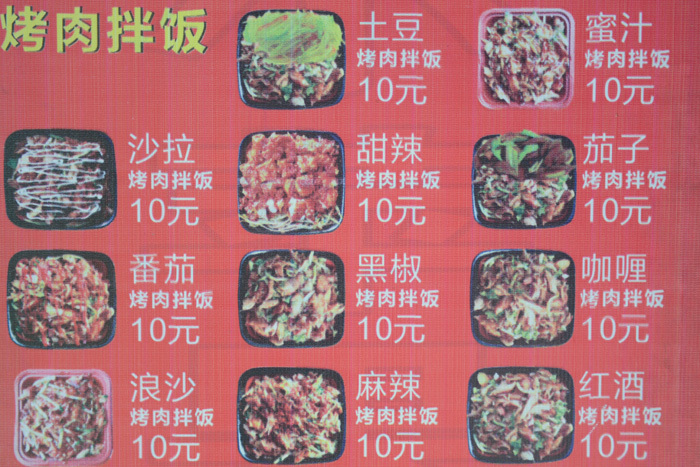 A menu for one of the barbecue Chinese bibimbap restaurants on my street. I had my classes lead campus tours again which is one of my favorite lessons to do. The students choose different places around the school and the class walks around together as students take turns leading the tour. 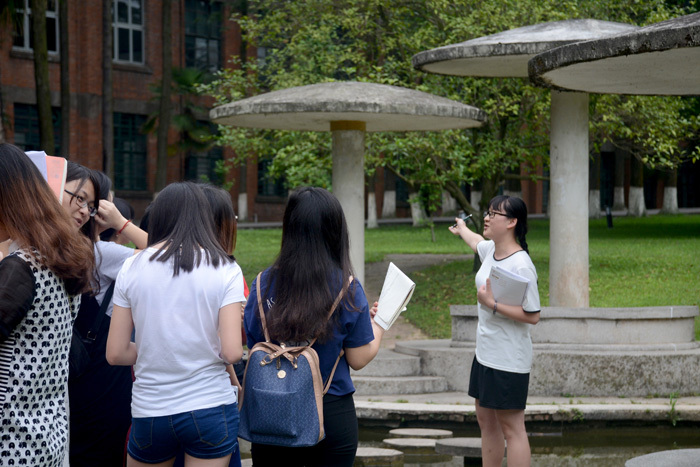 In this picture, Winter is talking about the mushroom umbrella pond while some of the other students listen. I wasn’t sure if I should post this photo because I’ve already taken so many photos of goats. But then I thought, how can you ever have too many photos of goats? 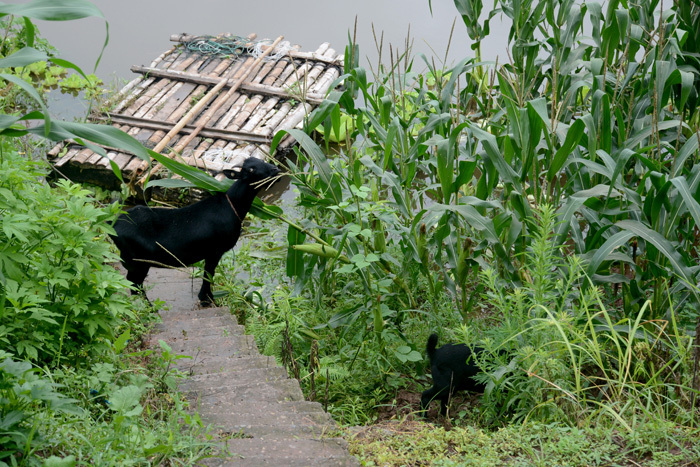 These goats are snacking on corn. Tasty take out food. 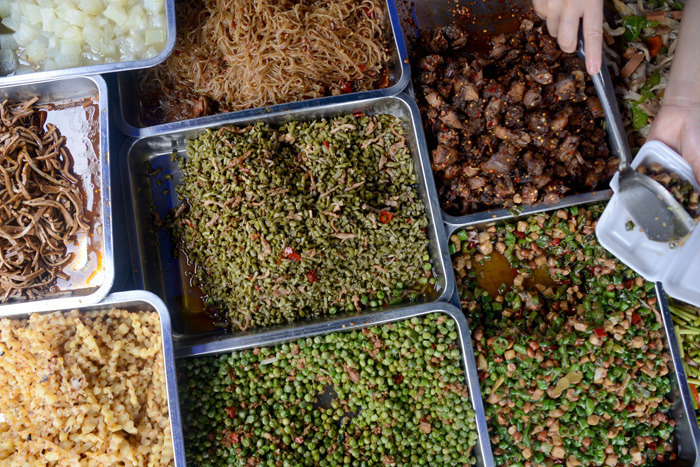 You can choose three dishes that you get with a container of rice which costs the equivalent of $1. The food is cooked off campus and is wheeled on a cart onto my street during lunch and dinner time. Two people walk down my apartment building’s path. 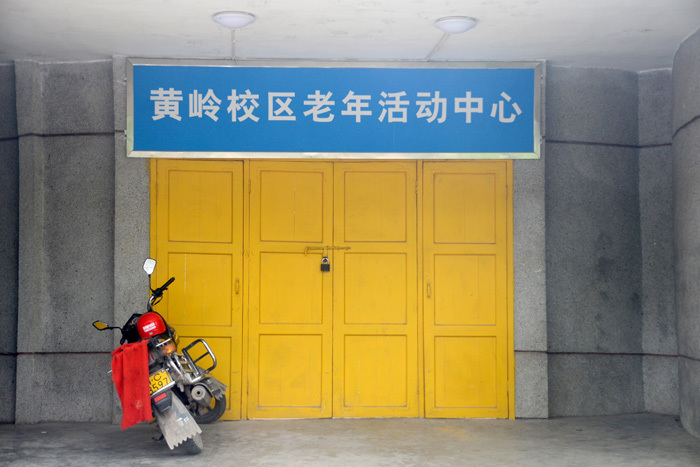 I live about 100 meters away from the ‘Huangling school campus old age activity center.’ In the apartment complex that I live in there are two non-apartment buildings – this is one of them and the other is the roller rink. Older people in the apartment complex like to congregate here to play mah jong and their grandchildren come along too to play outside on the concrete slide. They are all very friendly and exceptionally small. I walk by this building every day when I leave my apartment. Around 3pm in the afternoon everyone wakes up from their naps and gets back to work. 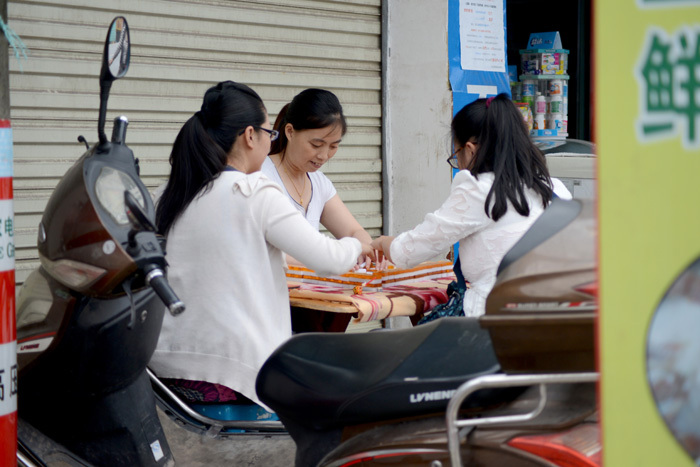 Business is usually slow for the shopkeepers on my street before dinner time (most students are in class) so a lot of them like to play mah jong together outside their stores. If someone comes into their store during this time, they will get up and help you, but they always seem to be very eager to get back to their game. 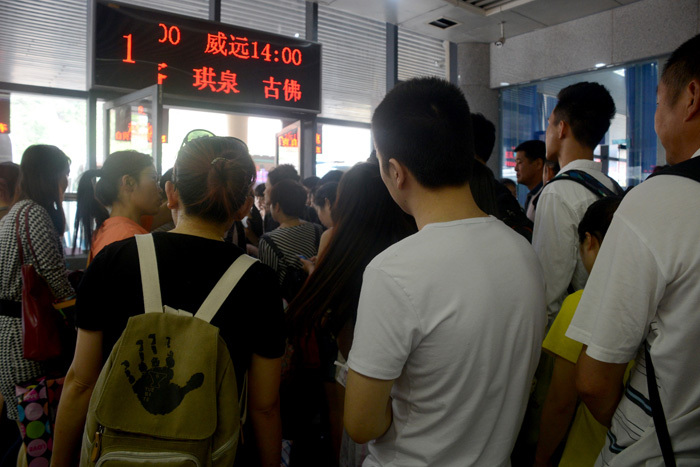 At bus stations in China you can go into the station whenever you want, but you can only go out into the bus parking lot about ten minutes before your bus leaves. There are different gates/doors that you go through depending on where your bus is parked. A ticket lady stands at the door, announcing buses that are boarding and checks tickets. These people are waiting for the ticket lady to announce that their bus is boarding and have chosen to stand in a giant pile in front of the door. If your bus boards before theirs like mine did you have to shove your way past everyone to get to the door. 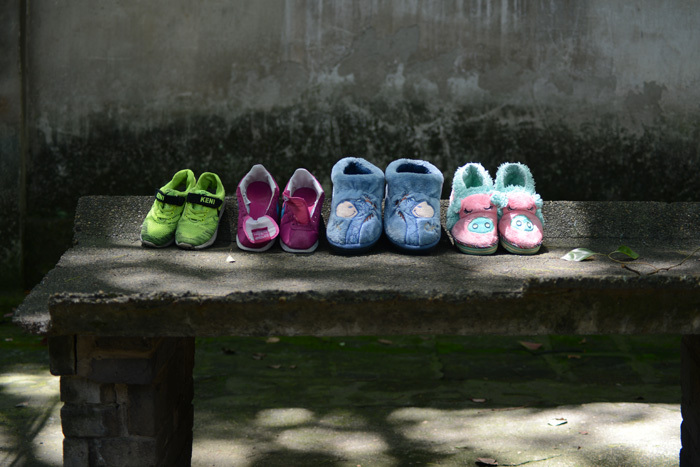 I went to visit my great friend Gina and a few other Peace Corps volunteers in Mianyang, about 4.5 hours away! It is packed in the Mianyang Walmart’s home appliance section. Imagine this plus constant loudspeakers announcing new deals. 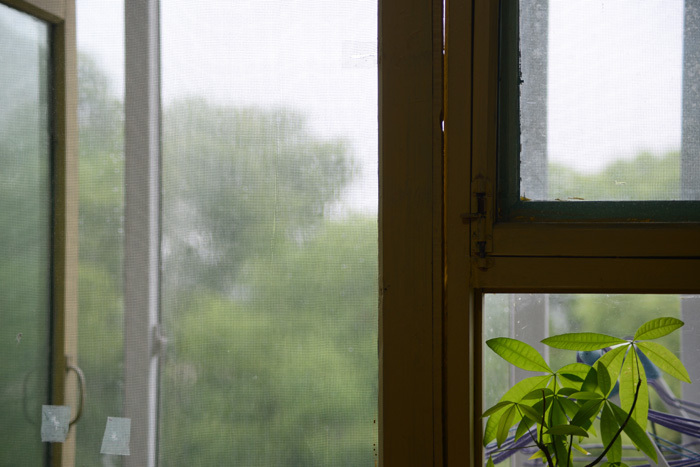 The view from a Peace Corps volunteer’s apartment in Mianyang. I think this picture almost looks like a miniature replica because the buildings are all so cookie cutter-ish. 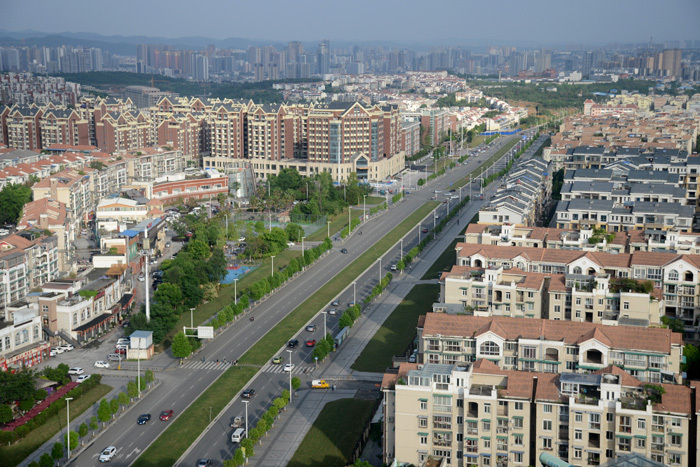 Mianyang is the second biggest city in Sichuan province with 4.6 million people and is known for its science and technology development. 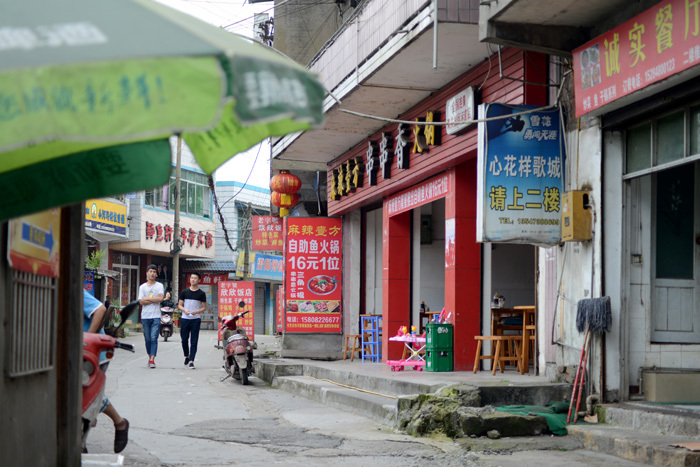 An area called “Science City,” a big city located inside of Mianyang city is off limits to foreigners because the government does science research there. Ping pong is probably the third most common hobby here after sleeping and eating (both answers that I frequently get when I ask people what they like to do). 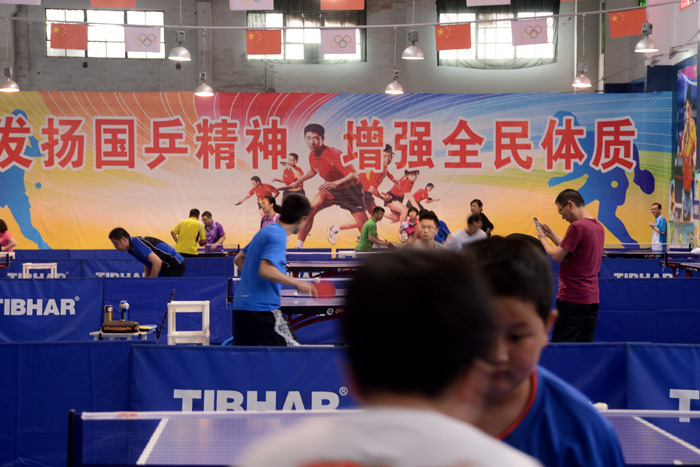 In my town the ping pong courts are cement tables, but in Mianyang these people play at a fancy indoor sports center with many courts. A group of Peace Corps volunteers and I went to the sports center to rock climb and do archery. It was pretty empty in that section – little did we know everyone was over here playing ping pong. 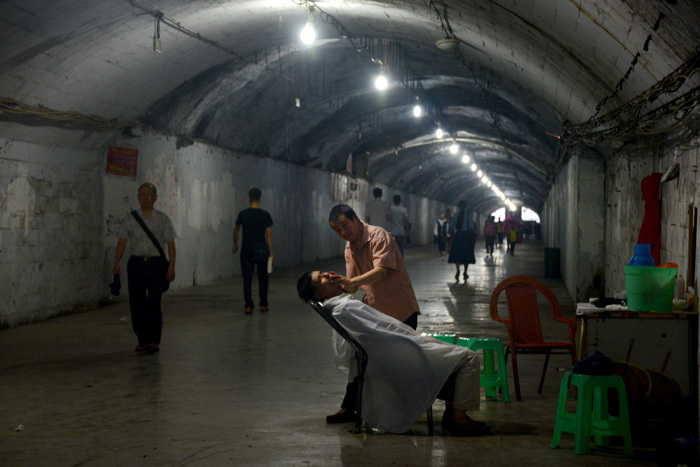 A man gets his hair cut in the tunnel bridge in Zigong. The friend who I was walking with told me that this was a traditional Chinese hair cut, but it was unclear what exactly made this traditionally Chinese. Because he’s cutting someone’s hair in a dark tunnel? Because he’s using scissors? Down the street. 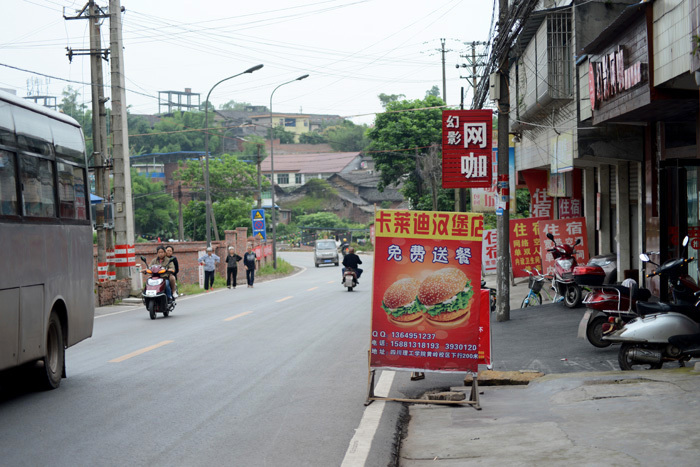 Students walk by a hot pot and chuan chuan restaurant (Brian’s favorite Chinese food). 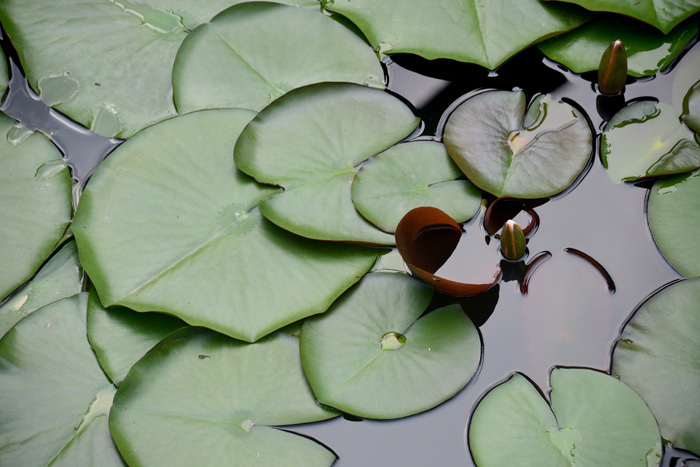 At the school’s lotus pond. The pond looked so dead in winter, but now flowers are coming out again! 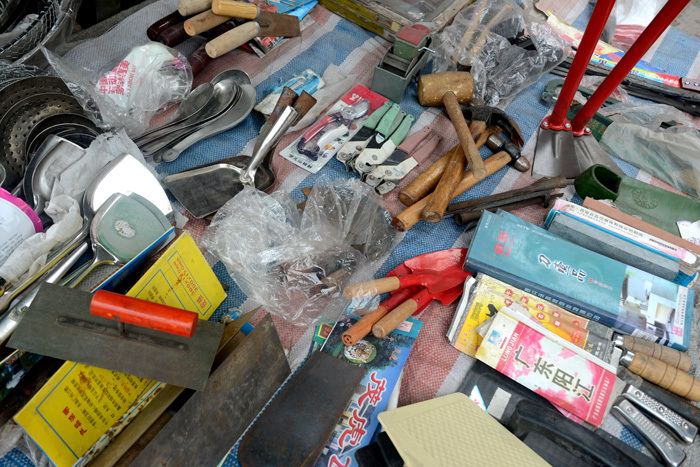 Slightly used tools are sold on a mat on the ground in Dengguan. 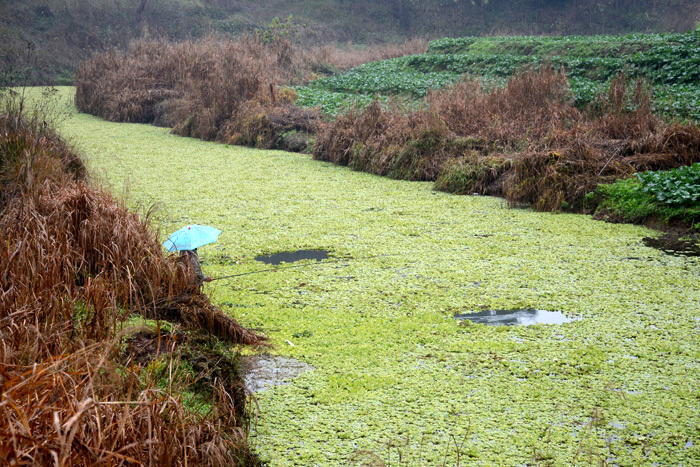 An area of Zigong flooded after a heavy storm the night before. Luckily there was a small path next to the stores that was raised slightly so people could still get to school and work without walking through the muddy flood water. Right outside of town. The sign warns against touching the electrical cables. Students crossing the street at night after watching a dance competition in the auditorium. The traffic going down the street has been getting pretty bad and cars speed through the town without waiting to let people cross. At the end of the street there is a driving school where many students take classes on the weekends. 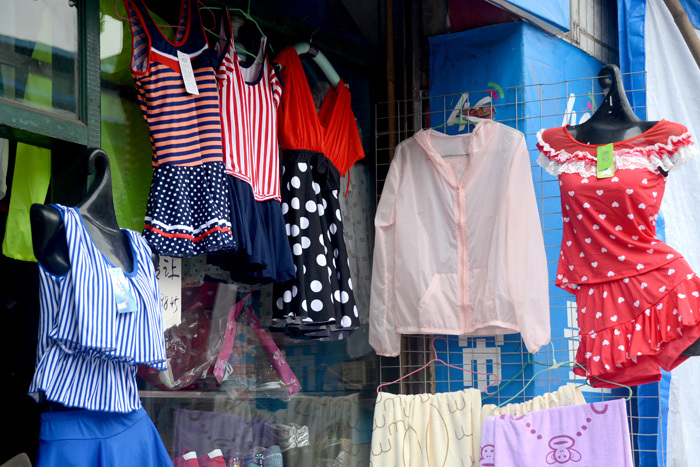 Last year this place was a clothing factory. Though very few people own cars, having a driver’s license can help students get a better job in the future. From what I have heard the tests are crazy (similar to every other test here) and it is very common to fail the test multiple times. 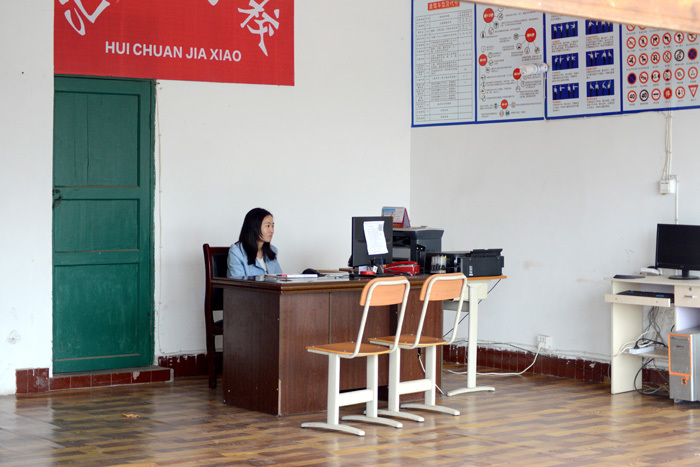 Here is a good NPR article about drivers licenses and taking tests in China. 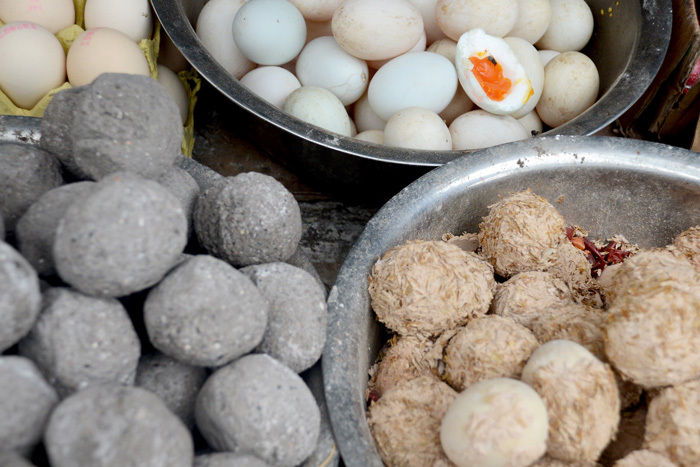 The eggs in the front are preserved, century eggs. The process turns the egg yolk dark green and the egg white into a stiff, dark jelly. The eggs in the back are salted duck eggs which taste salty and sort of like chalky gelatin. Century eggs taste fine, but seem like an unnecessary food, and I HATE the taste of salted duck eggs. I focused my lens on the eggs in the back so you could better see the fly. 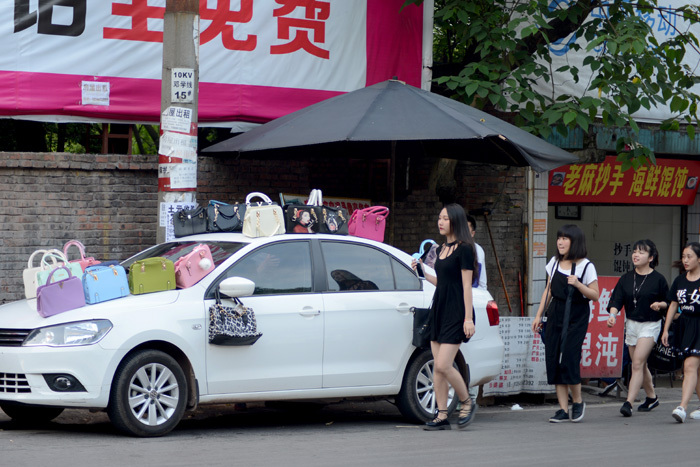 Girls in black walk by colorful purses being sold on top of a car. A teacher friend invited me to come visit her son’s school which is the best elementary school in Zigong. It was a very different environment and experience from the school that I went to out in the countryside last semester which is one of the worst elementary schools in the county. My friend and I went to visit one fourth and two fifth grade classes. 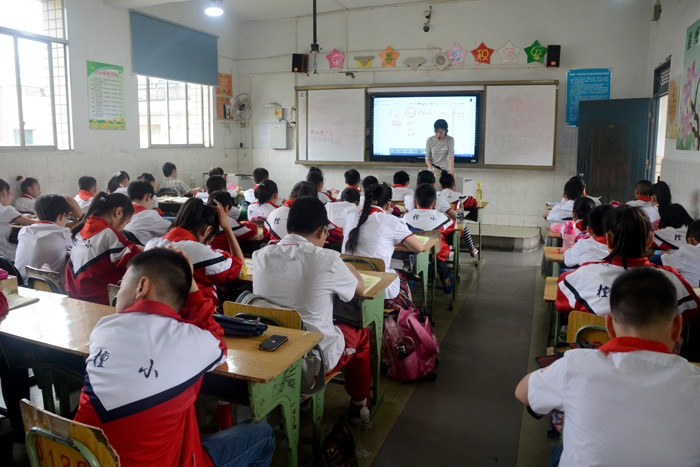 The classes all had about 50 students in them and the teacher stood at the front and lectured while students quietly read from textbooks, standing up to answer questions if they were called on. The kids all seemed very happy though and were thrilled to have a foreign visitor. It was a little overwhelming navigating the hallways surrounded by so many new friends. Sitting on my bed, looking at my favorite plant and the view out the window. Fishing in the countryside around my school. It is so pretty walking around here. 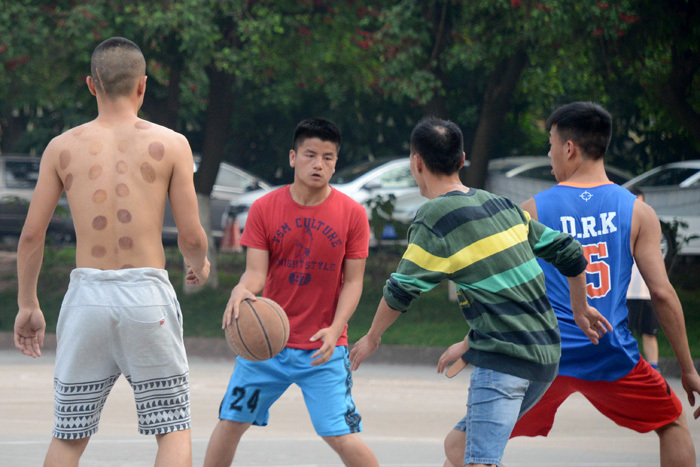 When I first came to China I went with my host family to see a traditional Chinese doctor who did cupping – a ‘treatment’ for a broad range of medical conditions. After the cupping is finished, dark circles appear on the skin, caused by rupturing the capillaries just under the skin. It is pretty common to see people walking around who have these dark circles on their back and shoulders. The red and purple circles fade within a week or so. A sign for the new hamburger restaurant on my street. The restaurant has been really popular with students even though it’s much more expensive than the other Chinese restaurants nearby. I’ve gotten many questions about hamburgers from people here who are convinced that Americans eat hamburgers every day. 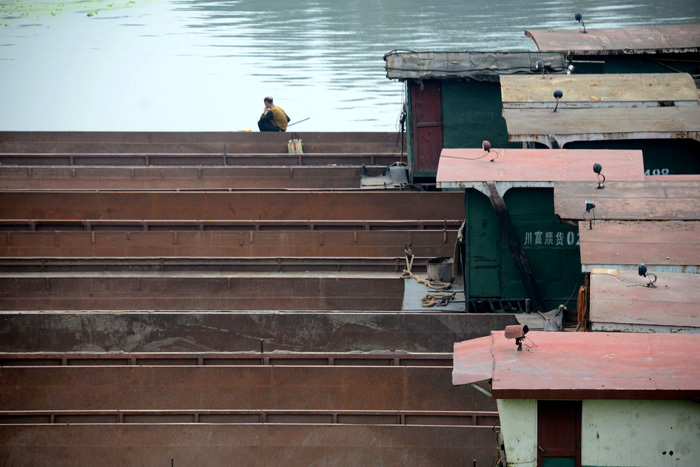 Boats in the river in Dengguan. 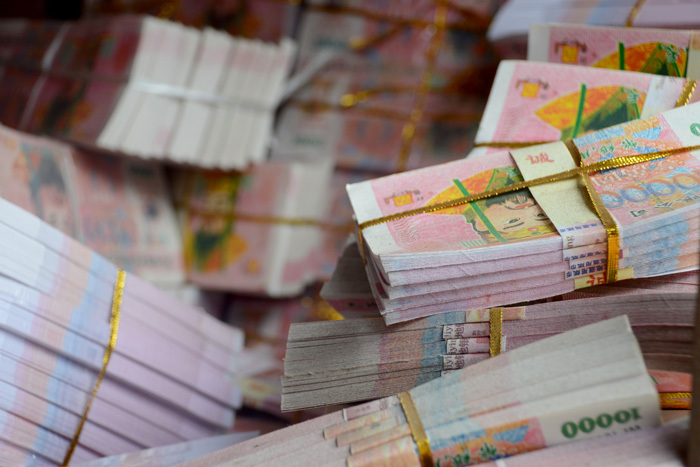 Stacks of fake money in a store in Dengguan. These are burned on holidays and during funerals to ensure that the dead are able to have everything they want in the afterlife. Apparently burning money or paper at funerals is a common tradition in many Asian countries. 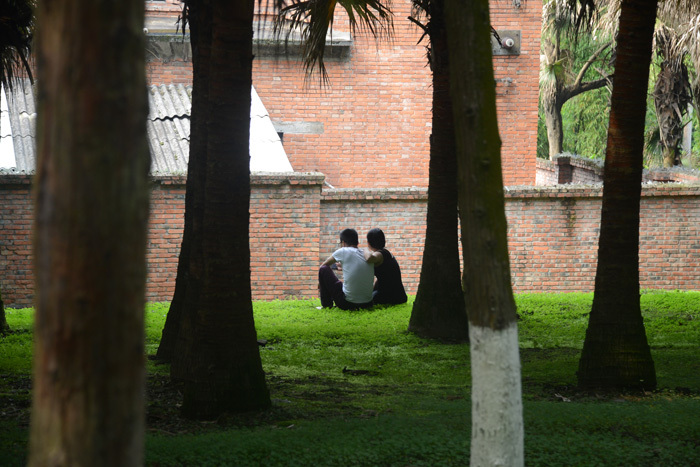 A student couple hangs out in the school forest. 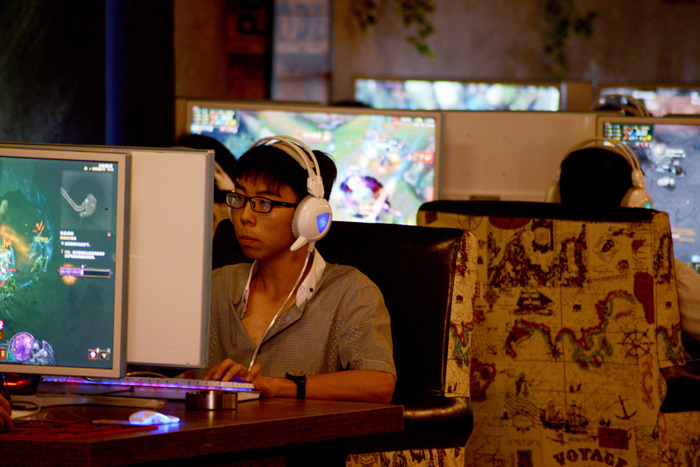 I’ve been trying to get a good picture inside an internet cafe for a while now and unfortunately this might be the best I’ll ever get. There are three internet cafes on my street and every night they are filled with (mostly) male students playing League of Legends. Some students have their own computers, but most don’t so instead these guys sit here in the dark for hours. It’s almost swimming time in PE class (these are swimsuits!) and it is all everyone has been talking about recently. I live across the street from campus along with other teachers and street vendors and the school frequently posts announcements around our apartment complex, usually about things like planned power outages or holiday information. This week a new sign was posted announcing that most students can’t swim and that if anyone saw any students around the pool unsupervised they should immediately be reported. 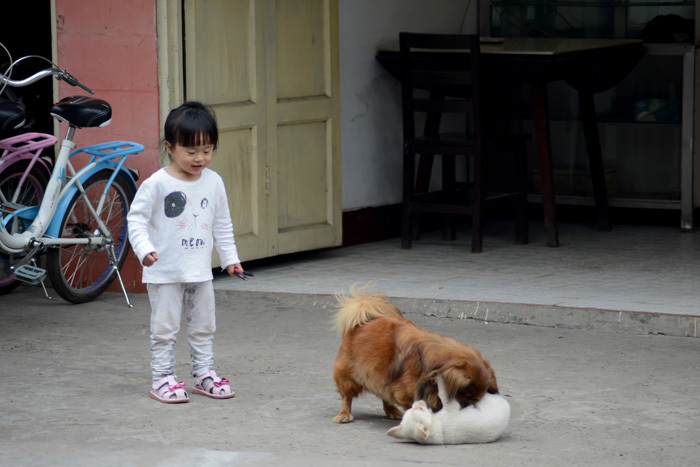 The little daughter of the bike shop family watches little dogs wrestle outside of the store. 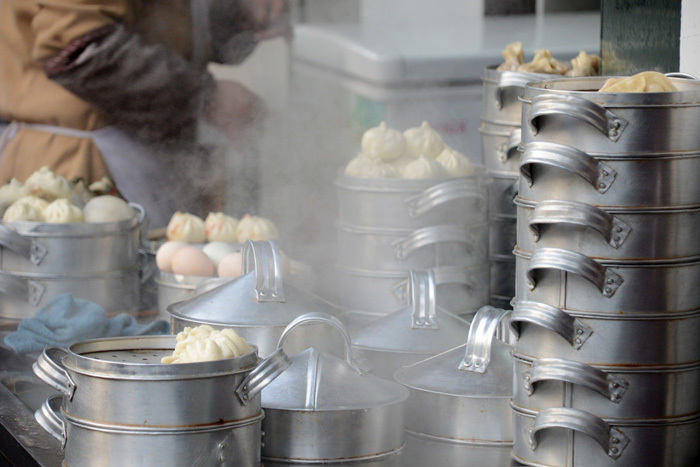 Steamed buns, dumplings, and hard boiled tea eggs are some of the most popular breakfast foods and are sold every morning from 7:30-9:30. 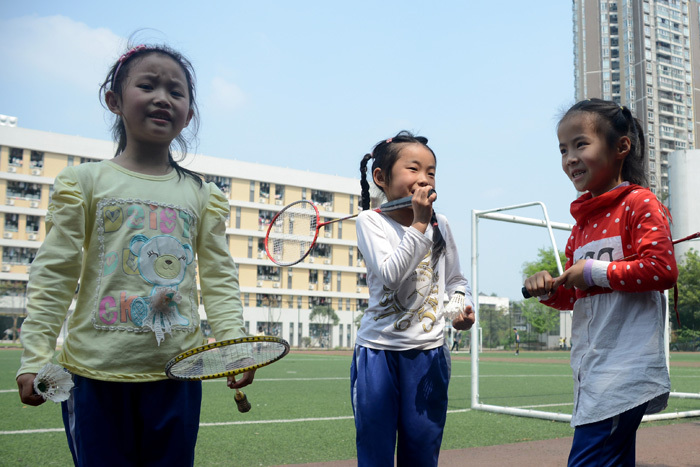 These three badminton girls came over to visit while I was sitting on the school field. 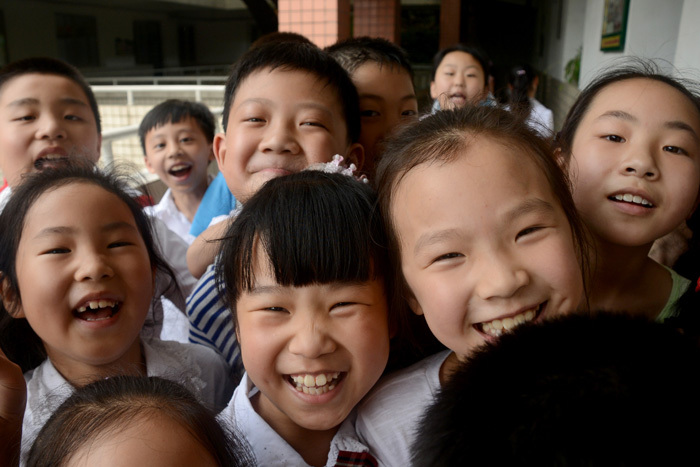 It’s pretty nice talking to kids because they are usually very excited, ask interesting questions, and think that I can speak fluent Chinese. Sometimes it’s hard talking to random people here. Many times I’ve had people look at the foreigner and become so convinced that I am talking to them in a foreign language that they are unable to process at first that I am speaking Chinese. Other times if I ask a question in Chinese to college students who have studied some English they will look at me and try so hard to remember how to say “I’m sorry, I don’t understand” that they don’t even bother to listen to what I am saying.